Toy Story 2 is a 1999 CGI film, the third Disney/Pixar feature film, and the sequel to Toy Story, which features the adventures of a group of toys that come to life when humans are not around to see them. 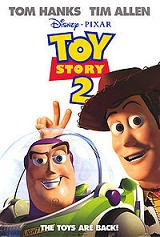 Like the first film, Toy Story 2 was produced by Pixar Animation Studios, directed by John Lasseter, Lee Unkrich and Ash Brannon, and released by Walt Disney Pictures and Buena Vista Distribution. Toy Story 2 is set for re-release in a double feature with Toy Story in Disney Digital 3-D on October 2, 2009, and Toy Story 3, is scheduled for release on June 18, 2010, is in development. Set a few years after Toy Story (1995), the movie begins with a Buzz Lightyear adventure, which turns out to be a video game that Rex is playing. Later, Andy accidentally tears Woody's arm while playing with him before leaving for cowboy camp (an annual trip he makes with Woody), leaving Woody on the shelf. Woody starts to have nightmares of becoming a discarded toy, but wakes to find that Wheezy, a penguin toy whose squeaker is broken, is being taken by Andy's mother to be sold at a yard sale. Woody rescues Wheezy with the help of Andy's dog Buster (who was mentioned at the end of the previous film as a puppy), but he is accidentally left behind at the yard sale and subsequently stolen by a toy store owner, Al McWhiggin. Buzz Lightyear and the other toys watch in horror, and Buzz sets up a rescue party with Mr. Potato Head, Rex, Slinky Dog and Hamm to bring Woody back. Woody is brought to Al's apartment, where he discovers that he is a toy created from Woody's Roundup, a popular children's television show from the 1950s. By acquiring him, Al now has a complete collection of the show's merchandise, which he plans to sell to a toy museum in Tokyo, Japan. Woody meets the toy versions of the show's co-stars: his sidekick Jessie, his horse Bullseye, and an old prospector named Stinky Pete formerly known as 'The Prospector' (who is still apparently in mint condition in his original box). These three are excited to be going to Japan. But knowing that he is still Andy's toy, Woody has doubts and tries to escape the apartment but without success. Later, Al brings over a toy repairman, who restores Woody's arm and gives him a fresh paint job, which Woody appreciates. He slowly warms up to the idea of going to Japan, particularly after learning that Jessie was once the favorite toy of a little girl named Emily who gave her away after growing up and he is convinced by Stinky Pete that, if he returns to Andy, he will eventually be thrown away when he grows up, whereas if he goes to Japan, he will be remembered and treasured forever. Meanwhile, Buzz and the others make their way to the toy store to try to locate Woody. During their escapades, Buzz encounters a newer version of himself (mirroring Woody's encounter with Buzz in the first film), and gets in a fight with the newer Buzz, who overpowers him and imprisons him in a cardboard box. The rest of the rescue team mistakenly takes Buzz #2 with them across the street to Al's apartment, where they now know Woody is being kept. Buzz #1 manages to escape and follows the team, inadvertently letting loose a figure of his sworn enemy, Emperor Zurg, who follows to destroy him. The team breaks into Al's apartment and attempts to take Woody home, but he refuses to leave. Buzz #1 catches up and uses Woody's words from the first film to remind him that he is a toy, meant to be played with, and persuades him to come with them. Woody turns his back on Buzz, but eventually comes to his senses. After calling Buzz and the other toys back, Woody invites the other toys from Woody's Roundup to come along, but Stinky Pete (now out of his box) blocks the escape route, determined to get them to Japan, as it is the only chance he has to finally be appreciated since he has never been sold. As Al packs up the collection for shipping overseas, Buzz #1 and the team follow him in a hijacked Pizza Planet delivery pickup truck, while Buzz #2 stays behind to keep Zurg occupied. Along the way they are joined by three Squeeze Toy Aliens whom Mr. Potato Head saves from falling out of the van. In the baggage handling area of the airport, The Prospector faces off with Buzz #1, then Woody, with The Prospector reopening the old rip in Woody's arm; the team then distracts Pete long enough to stuff him into a little girl's backpack, so that he will learn what it means to be a toy. The toys free Bullseye from the crate, but too late to free Jessie, as the crate gets loaded into the plane's cargo hold. Assisted by Buzz and Bullseye, Woody slips on board and extracts her from the cargo hold just before the plane takes off. The toys happily return home in a luggage transporter and soon learn that, due to Al's failure to sell the merchandise collection, his business and his mood have both declined sharply. When Andy comes home from camp, he is excited to see the new additions to his own collection: Jessie, Bullseye, and the Squeeze Toy Aliens, believing that his mom got them for him while he was away. He repairs Woody's arm and marks Jessie and Bullseye with his name, making them feel appreciated again. Buzz shows signs of attraction to Jessie after she performs a similar stunt that Buzz did in the first film (his wings inadvertently extend in astonishment). Woody and Buzz now accept the fact that Andy will eventually grow up, but even after he does, they will still be there for each other. The film concludes with a now-fixed Wheezy singing "You've Got a Friend in Me."